Ever since Burberry Prorsom's Spring 2013 show where models proceeded down the runway in stunning metallic trench coats, shine has taken center stage in the fashion forefront. Shimmering shades of pink, blue, green and violet are just as present next to classic silver and gold statement accessories. Above: Prabal Gurung's violet lame pants are a work of art yet shockingly wearable when paired with tailored pieces. A rose gold bomber jacket adds instant cool amongst the most seasoned of fashion crowds. Score one for your own closet here. Acne's metallic leather dress makes this blond look like an ice princess. Achieve a similar look for a fraction or the price in this or this. 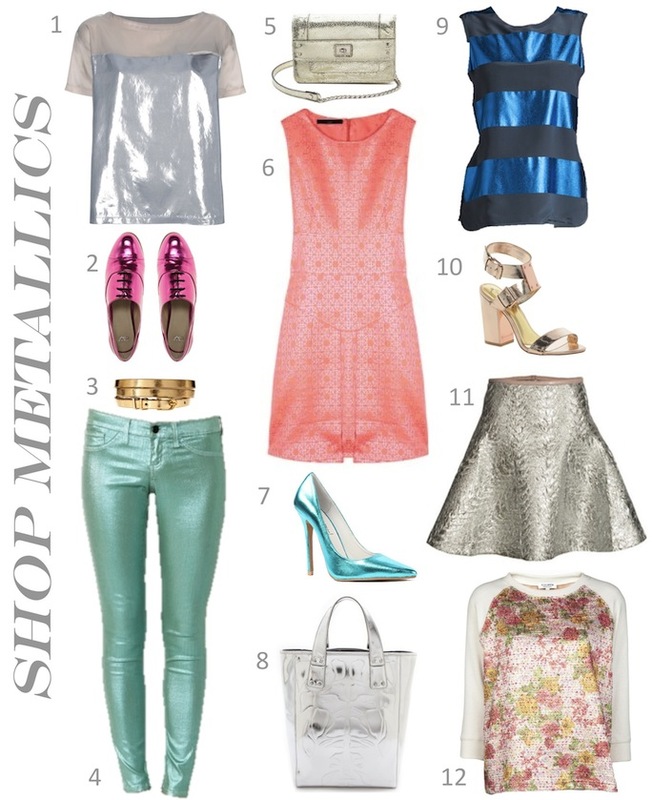 One of the easiest way to incorporate metallics into your wardrobe is with accessories. Metallic shoes are always show stoppers, and not just because they are blinding those around you by reflecting light;) Don't be afraid to try out more adventurous metallic shades in small doses such as a lime green bag or shiny cobalt blue flats. That dress in the middle is gorgeous! 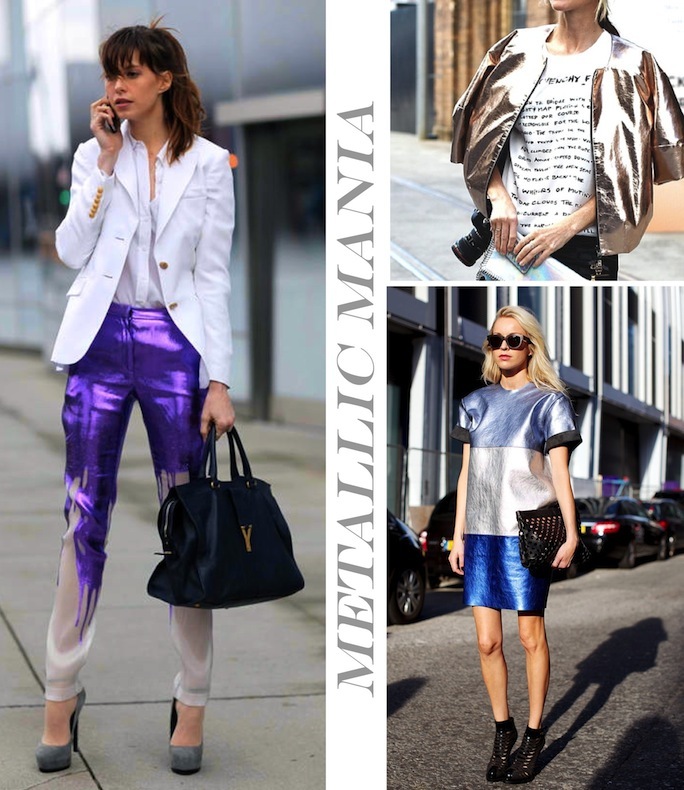 I'm all about metallics–that skirt is awesome! Love that pink dress! I love metallics because they enhance my shape! my gosh those purple pants are amazing! Loving all your picks as well! Stunning post, the metallics are a welcome come back! Love metallics! Such a great post! Those oxfords were just added to my cart;) Such great pics! Love these inspirations! And the metallic shoes on the Heels ! Oh yes, this is just so opulent and beautiful! Ooh those Prabel pants are to die for! Seriously in love with them and quite fancy a few of your picks like those fab NG pants! Whoa -- I need that Antipodium skirt! And the Jeffrey Campbell pumps! Nice picks. Oohh, this is one trend that I haven't yet got into, but it's brilliant- literally! i love rose gold anything! Great post! I've been looking for the perfect silver metallic pumps for a while now, but no luck yet.